Zoom into Israel – Cool site! Since we are now here with our group, I thought you might like to take a virtual tour of Jerusalem’s Old City. I run around the walls of the city almost every day. 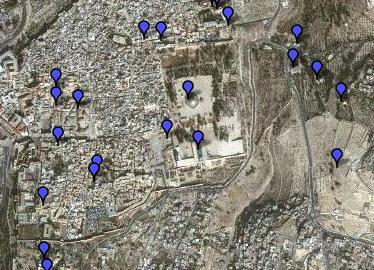 This is a wonderful website where you can click on various “pinpoints” and see the sites in Jerusalem. This is a great source to learn to learn about the many sites available for viewing in the Holy City. We visit many of these sites during our pilgrimages. Click here to begin the discovery. Join us in February, April or May as we visit most of these places. Check out our Pilgrimage website at www.SteveGoes.com. This is a great site, and very timely, thank you! Maybe people should be warned that Google Maps has large ads on the pages for a ‘Kaballah personality quiz.’ Not exactly something you want your kids to delve into while clicking around the maps of the Holy Land!